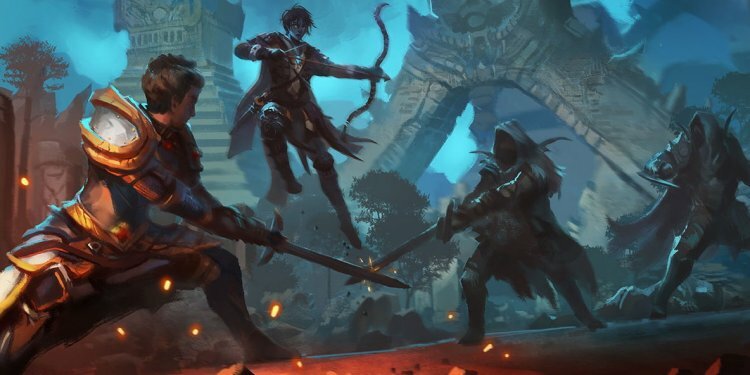 Last year a group of Bioware veterans under the studio name ‘KnightMayor’ announced Mooncrest, a Neverwinter Nights inspired game that promised a focus on character and narrative depth, combined with real-time “Souls-style” combat. The project was eventually put on “indefinite hiatus”, but KnightMayor is now continuing as a one-person studio, with former Mooncrest lead Rick Burton working on a more achievable tactical RPG project set in the Mooncrest universe. Mooncrest was meant to be an RPG based on the Paladin Trilogy of Neverwinter Nights mods, which were made by KnightMayor lead Rick Burton — a game designer with AAA titles under his belt like Mass Effect, Star Wars: The Old Republic and Dragon Age: Origins. Mooncrest‘s difficulties started with the cancellation of its Kickstarter, after getting only one tenth of the way to its ambitious $US400, 000 goal. There was talk of starting a new $US40, 000 Kickstarter simply to fund a vertical slice, but eventually the team fell apart and the project was put on indefinite hiatus. Since attempting to launch the Mooncrest project, there have been more “ups and downs” than I can cover in one blog post. The greatest truth of the experience is that holding together a team while everyone individually has to struggle with the realities of life was a larger task than could be pulled together. And even with reboots with smaller groups, “real life” was still getting the upper hand. Eventually, this left one person… Me. The new game is set to be a tactical RPG, a scaled-down project that Burton hopes is achievable by one person. The game system is inspired by an old game known as Warsong, while other influences on storytelling and character progression are said to be similar to the systems used in Fire Emblem Fates and Disgaea. Story-wise, the new game won’t even touch on the territory that was meant to be covered by Mooncrest, as it’s clear that Burton hopes for KnightMayor to eventually build up enough momentum to get back to developing that original concept. The new TRPG will be set centuries before the “Paladin Trilogy” of Mooncrest. This is a time before magic, Paladin Orders, Fayn and Urzai and a realm that is completely unprepared for these new arrivals. The story of this Mooncrest prequel centers on the events that introduce them all to Nocturne. In the first blog post, I stated that my greatest motivation to keep going on as a solo dev was to “keep the Mooncrest dream alive.” As a part of that plan, KnightMayor must grow to be strong enough to handle the scope of the Mooncrest trilogy. But the plan includes revealing more on the world of Nocturne. The hope is to cultivate a fanbase for the setting to support a future attempt at the trilogy while establishing a deep, rich backdrop for the main Mooncrest story. It’ll be interesting to see where this project goes, and if it will eventually lead to the development of the proper “Paladin Trilogy” as intended. For those who are bigger fans of Bioware’s classic games than the ones they are producing now, it’s worth keeping an eye on what KnightMayor is working on.